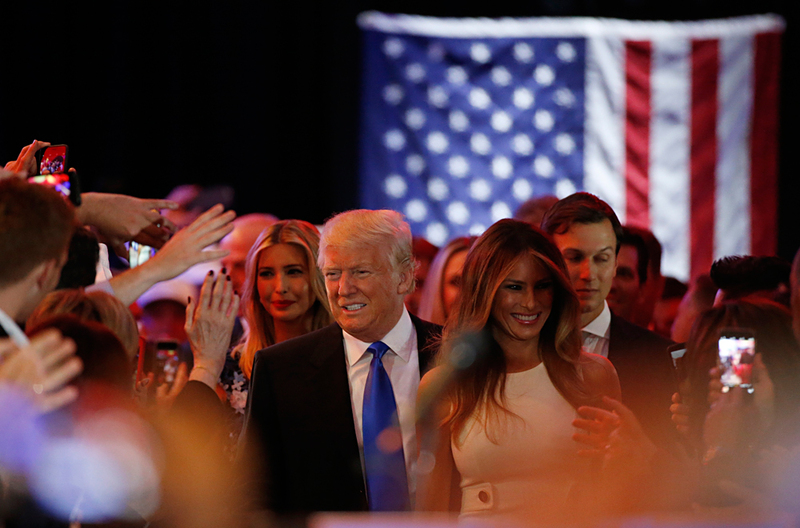 Republican U.S. presidential candidate Donald Trump arrives with his wife Melania at his campaign victory party to speak to supporters after his rival Ted Cruz dropped out of the race following the results of the Indiana state primary, at Trump Tower in Manhattan, New York, U.S., May 3, 2016. Russians are not united as to what outcome of the U.S. presidential elections would serve Russian interests best, the Public Opinion Foundation said in its report. Some 37 percent of respondents were undecided, and 26 percent claimed that U.S. election results were immaterial to Russia: "the U.S. attitude to Russia would not improve, no matter who the winner is" (6 percent) and "that is Americans' business, which has nothing to do with us" (5 percent). Still, some Russians (28 percent) believe that a victory for Donald Trump would be more significant for Russia than a victory for Hillary Clinton (9 percent). The foundation polled 1,000 respondents over the phone on May 28-29. The respondents explained that Trump "is better disposed towards Russia and bilateral relations may therefore improve" (14 percent), while "Trump's rival from the Democratic Party disliked Russia, was aggressive and not nice" (6 percent). On the whole, Trump made a good impression on 22 percent of Russians while Clinton was favored by only 8 percent. A total of 23 percent and 46 percent of respondents expressed their negative feelings, respectively. Forty-four percent of Russians are unaware of Trump, and 36% know nothing about Clinton. The Democratic and Republican parties will have primaries in five states on June 7, the last Super Tuesday event. This Super Tuesday will finalize the Republican primaries, while the Democrats will have more primaries in the District of Columbia on June 14, after which the results of choosing a presidential candidate will be summarized. Billionaire Donald Trump has actually guaranteed his nomination by the Republican Party for presidential elections in November. The New York Times said he had secured the support of 1239 delegates, while at least 1,237 votes were necessary for the nomination. All of his rivals have dropped out of the race. Former Secretary of State Hillary Clinton is still competing against Vermont Senator Bernie Sanders in the Democratic camp. According to The New York Times, the senator remains hopeful to deprive Clinton of the majority she would need to be nominated for president by winning over the so-called 'super delegates'. As of now, Clinton is lacking about 30 votes. Sanders has gained the support of 1,517 delegates, while Clinton is backed by 1,807. The former state secretary has also won over 548 super delegates, representatives of the establishment who may vote for any candidate, irrespective of the outcomes of primaries in their states.